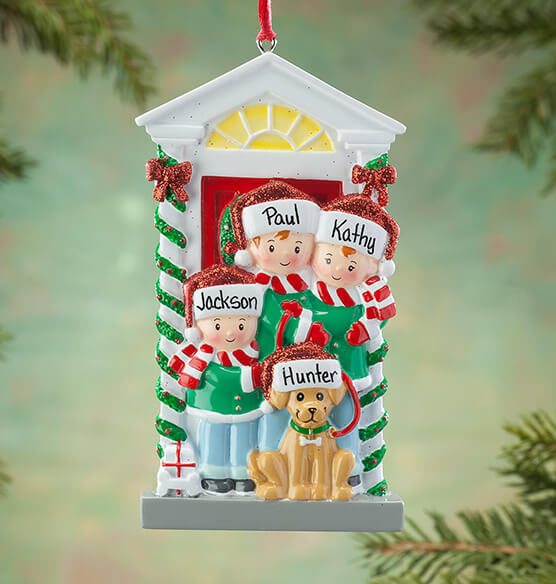 Personalized Family and Dog Ornament includes the whole family, even the 4-legged member! 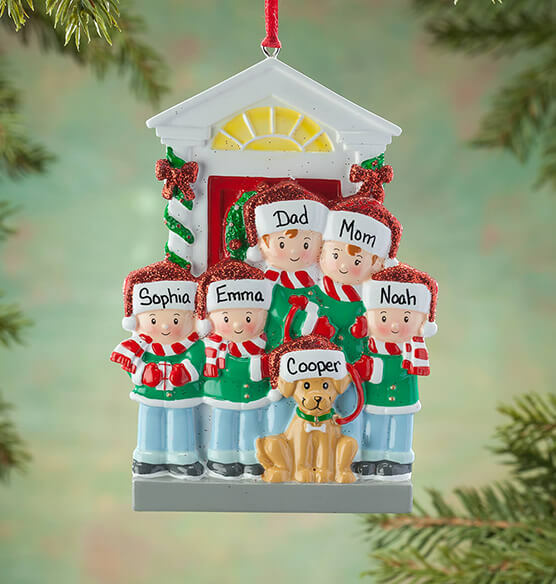 Choose from a family of 2, 3, 4, 5 or 6 plus the dog, and we'll add first names to all the hats. Specify names. No Personalization Family of 2 , No Personalization Family of 3 , No Personalization Family of 4 , Personalized Family of 2 , Personalized Family of 3 , Personalized Family of 4 are not available at this time. It is my fiance and I's first Christmas in our home with our dog! We are beginning our Christmas tradition of gifting each other ornaments each year, that are relevant to events throughout our year. New dog, after losing our beloved dog, Cooper during surgery at the age of 3 years old. 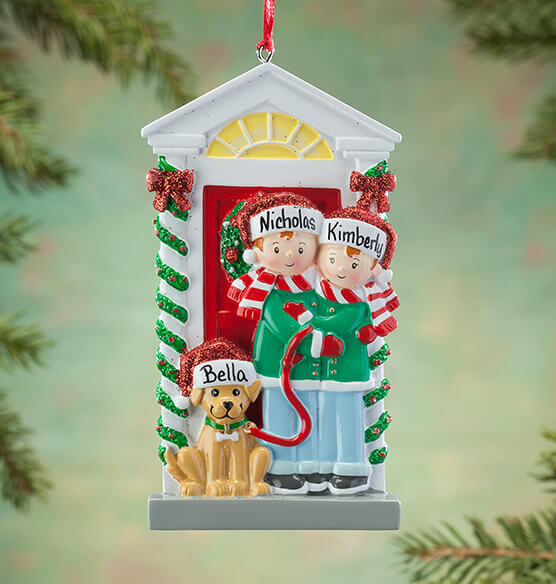 It was difficult to find a personalized ornament for just a couple with a dog - this one looks really cute. 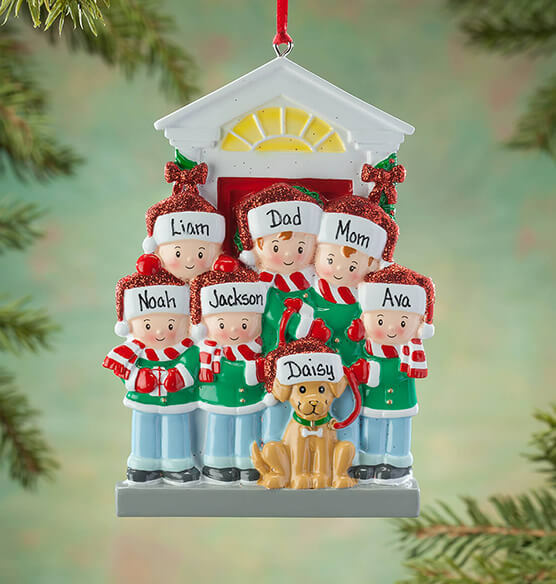 Only family ornament I saw with a dog. Wish the pajamas family one had a dog choice add on too! Can I get 1 person & 1dog? BEST ANSWER: Thank you for your question. Unfortunately this does not come with one person with the dog. We hope this information will be of help to you. can color of dog be changed ? BEST ANSWER: Thank you for your question. We do not change the color of the dog. We hope this information will be of help to you. can you add the year to the ornament? BEST ANSWER: Thank you for your question. Unfortunately no there is not enough room for the date. We hope this information will be of help to you. Is there anyway to add more pets? like a dog and two cats? BEST ANSWER: Thank you for your question. Unfortunately we are not able to add any pets. We hope this information will be of help to you. can i add one more dog? BEST ANSWER: Thank you for your question. Unfortunately no we are not able to add another dog. We hope this information will be of help to you. 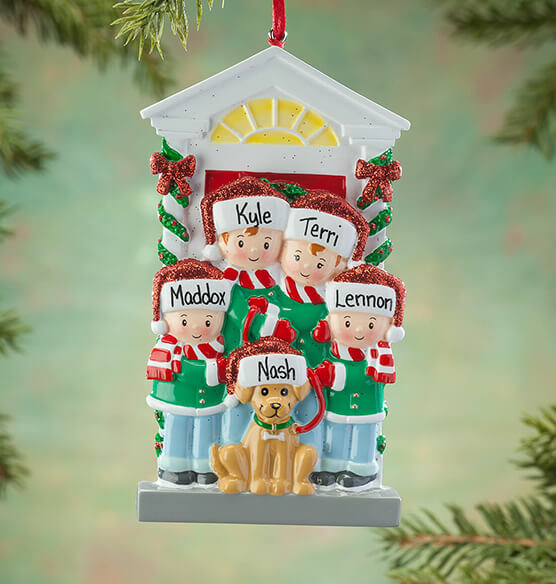 I want an ornament that has one adult one child and a dog to personalize it - is that possible? BEST ANSWER: Thank you for your question. Yes choose family of two. It has room for two names and one dog name. We hope this information will be of help to you.